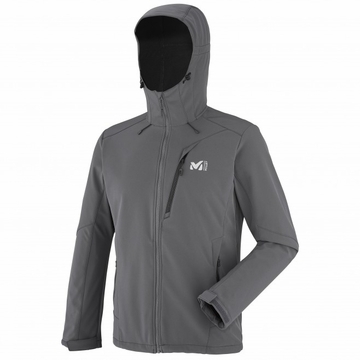 "For outdoor escapes and alpine treks, this stretch action jacket features a highly versatile ELEMENT SHIELD ACTIV 3L laminated build for venturing into chilly mid mountains. A dynamic unit for explo ring unknown lands, this softshell jacket is windproof, has a DWR finish, and is resistant to wear - in a more supple and lightweight package. The brushed-fleece lining retains cozy warmth in cold conditions while delivering the breathability required for active disciplines. Efficient in many kinds of weather, it focuses on feelgood comfy ergonomics and a style that readily crosses over to daily life.